Now in some ways it’s been a frustrating 2014 so far. In ten attempts to get fixtures on this year, seven have been postponed. This, in theory, should do nothing for our momentum, and yet in the three games we have got going in that time we have advanced to the semi-finals of two cup competitions. Alright so we’re about twenty-eight games behind everyone else in the league, and will probably have to play every night in April, but fug it, we’re in the mood for a MUG! …so, now my beautiful mush has been restored to its previous glory, is it ready for what’s to come? We now face a two-legged semi-final with Wembley Stadium awaiting the victors. Now, to draw opposition from the same league, rather than the higher National division, would be considered quite the boon. However, that same level club happens to be Gosport who, as stated previously, field about as many people with ‘Havant & Waterlooville FC’ on their CV as we do. The rejected, the excluded, the ignored; all lined up like spurned lovers, tarting themselves up in their freshest gladrags to not just impress but transcend; to make us regret our casting them adrift. We’ve been in an FA Trophy two-legged semi final before but that time, Wembley wasn’t the prize on offer and nor were we favourites. Now it is, and we are. Not sure I like it. One has to hope that our players enjoy that added pressure. It comes down to 180 minutes that the Portsmouth News and the local radio and TV are going to get proper giddy over. To have a club with a PO postcode, one of ‘their’ clubs, guaranteed a Wembley place, well, it’s like an emergency early Christmas, and all the little elves WILL be mobilised. It’s going to be a tiny bit mental for a couple of weeks folks. Prepare yourselves. Two legged and with such a prize on offer, it is a leveller and I guess there are no favourites, really speaking. Both sets of players will want it like the sweet air of life itself, or so we’d all hope anyway. Then again, I imagine Aldershot’s fans would have expected nothing less of their fellas for this Quarter Final. They have never seen the inside of Wembley, having been promoted for their short stint back in the Football League as champions rather than through the play-offs. So, in theory, there should have been no lack of desire, and indeed they came out looking box fresh, and for the first half an hour, they pretty much had the ball to themselves in our half. Ah well, we’ve done well to come this far. Valiant effort, and all that game. Then, out of nowhere, Shots midfielder Jordan Roberts, a lad who made three sub appearances for us on loan when we were between managers about eighteen months ago, gave a little shove to Perry Ryan as he passed and followed it up with a sly ankle tap. Perhaps he remembered the Perry Ryan of September 2012 when most Hawk fans would have walked a hundred miles to join a four hour queue to give Perry a bit of a kicking. If so, you can understand his faux pas. The (slightly) more mature Perry Ryan of the Bradbury-era though is not worthy of a booting, especially with no discernable provocation. It was unclear to most in the ground exactly what had gone on to cause Roberts to be given a straight red, those of us behind goals having to take to Twitter to discover what those sat in the stand would have seen. The ref had a clear view and although not a frenzied assault, any unnecessary business off the ball is likely to get you a dressing room to yourself. Around about this point, the rain started to fall as well. A fine but incessant rain, and it was clear from the fact it was coming in sideways just how difficult it had been for our handsome lads to progress towards us. Get to half time with a nil-all scoreline and we had a real chance especially with only ten Aldershot men running into wind and through the increasing gloop. Given the amount of rain south Hampshire has had in January, it’s a miracle we got three games on at all really, but it has taken its toll. The Westleigh Park’s pitch was a billiard table back in August. Now though, while still a billiard table, it’s one that’s been placed in with the more aggressive and excitable dung-flingers at Monkey World and with a cove’s worth of sand dumped onto the centre of it. So, whilst we didn’t want to resort to hoofing, trying to pass across the surface was a fool’s errand as well, and it was unsurprising that when our lead finally came, it was from a flighted set-piece. Perry Ryan’s took full advantage of the driving wind to bend his corner right into the cluster of bodies in the six yard box and, happily, the back of Dennis Oli’s big ol’ ‘ead was struck first, sending the ball between Glenn Morris’ flailing, slippery hands. Big cup matches at West Leigh Park under floodlights with a pulsing atmosphere, gotta love ‘em. We don’t get them often, but the most famous occasion, against Swansea City in the FA Cup, a single goal was never going to be sufficient to finish the job and momentum allowed to us to go nuts in a manner that divisional status should never have allowed. So it was to be here as we drove forward with such verve and intensity that the Aldershot defence fell apart like an Airfix Messerschmitt assembled using only saliva and over-confidence. Plus, we still had three corkers up our sleeve, which always helps. Four minutes after Oli’s bonce broke the deadlock, midfield hero Nigel Atangana swaggered forward like late-Seventies Travolta and, as Morris closed him down, hit the ball confidently semi-massé, like Ronnie O’Sullivan escaping a snooker; the swerve done to perfection and a two goal lead had. We had to wait twenty minutes for our third, but by this point we had all relaxed. Clearly substitute Alex Przespolewski was feeling quite comfortable as well as his strike after 72 minutes was the finish of a supremely confident man. Daniel Blanchett lofted a ball over the top of an Aldershot defence now apparently sleeping off a large one, and Prez was alert running forward lofting a first touch lob over Morris that dropped gently, like a party balloon noiselessly farting out the last of its helium. Now 3-0 against Conference National opposition is giddy enough territory as it is, and against Crawley Town in the FA Cup five years ago, we left it at that. Here, though, we gave them a couple of minutes before smashing in a fourth and, boy, was it smashed. Nic Ciardini has an eye for the long-range effort, and cutting in from the wing he strolled relatively unimpeded to the edge of penalty, from where he put his boot through the ball as though trying to burst it, the ball escaping to the safety of the net past Morris’ desperate dive. Four goals to the good, it was only at this point that Aldershot attempted to show there was life left in what appeared to be a twitching corpse. A penalty was won and scored, whilst Scott Bevan was required to make a couple of typically efficient, excellent saves. Then the final whistle blew and Aldershot’s noisy, flag-waving support silently trickled away leaving us to sing with exultation. On the Shots forum, many supporters blamed Roberts but one cast the blame elsewhere saying “On a personal level I blame my dad for ever taking me to this God forsaken club”. *snorts* Ah, schadenfreude. Sweet schadenfreude. 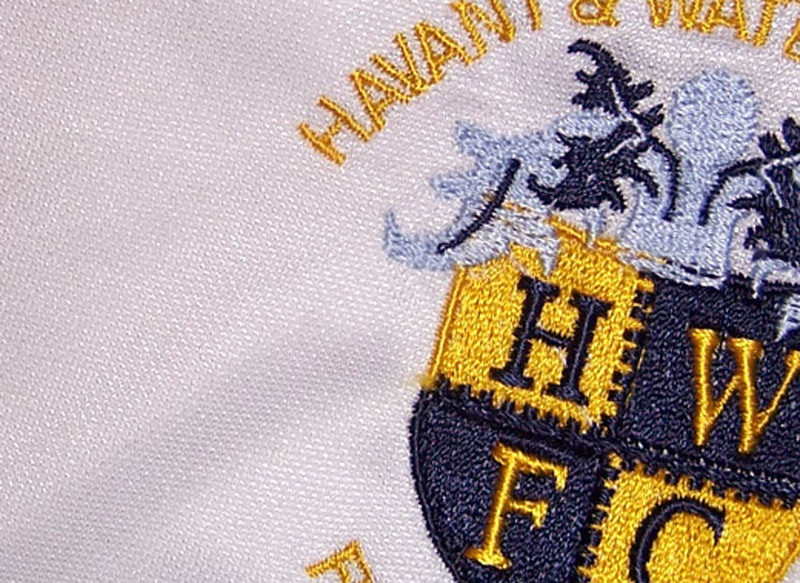 So, there it was again – “Wem-ber-lee, Wem-ber-lee, we’re the famous Havant ‘Looville and we’re off to Wem-ber-lee”, and now we’re two good performances away from being able to sing it with a slight tweak of the lyrics; from “off to” to “inside”. I’m nervous. I’m excited. Either way, I can’t wait. The first leg takes place at Westleigh Park on February 15th, the second at Gosport’s Privett Park a week later.